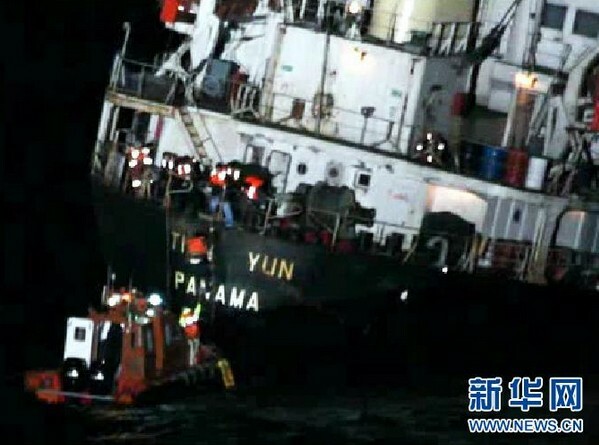 A Panama-registered cargo vessel sank in the Republic of Korea (ROK) waters Sunday afternoon and 17 Chinese crew members were rescued, according to Chinese consulate general in Busan, the largest port city in the country. The vessel, "Tian Yun", belongs to a company in China's northeastern Dalian City. The ROK police sent helicopters and patrol boats to rescue the crews immediately after they received report of the mishap, said sources with the consulate general. A Panama-registered cargo vessel sank in the Republic of Korea (ROK) waters Sunday afternoon and 17 Chinese crew members were rescued.